Rhodolite Garnet (Ovl), Natural White Cambodian Zircon J Hoop Earrings (with Push Back) in Rose Gold Overlay Sterling Silver 7.000 Ct. Silver wt. 5.60 Gms. Rhodolite Garnet (Pear), Natural Cambodian Zircon Teardrop Earrings (with Push Back) in Rose Gold Overlay Sterling Silver 10.500 Ct. Silver wt. 7.46 Gms. Purple Garnet (Ovl), Natural Cambodian Zircon Earrings (with Push Back) in Platinum Overlay Sterling Silver 2.500 Ct. The ravishing crimson magic of garnets makes them the best stones to clasp on at your ears. With exotic and entrancing hue, they become the beacon of admiring attention. The garnet earrings in our diverse array will let you have a peek at the luxurious range that these stones can be donned in. From faint minimalism to eloquent grandeur, we have all scopes and aspects covered. Find mentioned below a range so lush and regal that it will keep you wanting more. If you’re seeking earrings that add on to your ensemble with the perfect professional approach, then our stud earrings are just what you’re looking for. Available in several designs, like halo earrings, cluster earrings, or floral earrings, stud earrings have a scoping horizon. Simplistic yet trendy in approach, this selection is ideal if you want subtle hints of crimson allure. Another addition is of the hoop earrings. With an eternal demand, the garnet hoop earrings never seem to go out of fashion. They have reigned over the ramp walk fashion choices and will continue to do so for a long, long time to come. The luxurious colour show of contrasting metals only makes their flair all the more unique. Be it the picture of single-strand elegance or the poise of elaborate drops, the garnet drop earrings have all areas covered. In this feature, you’ll have access to swathing bouts of shimmering excellence. Hued richly in dark red, these earrings steal compliments and give you an edge of diva-like flair. 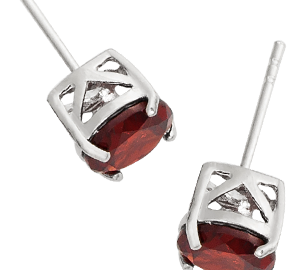 While there are several reasons why you should shop with us, the primary reason is because we offer you the best array of garnet earrings online in UK. Our collection is rich, diverse, and available at reasonable prices. In our sizzling selection, you’ll don thrill of novel designs and artistic works of our ardent designers, who burn the midnight oil to perfect each outlay. The use of contrasting tones of gold (yellow, rose, and white,) platinum, rhodium, silver, et cetera only adds to the appeal. Along with that, our garnet earrings in UK also come available to you at unbelievable prices. We source our gemstones from the most reliable and authentic resources, or even directly from mines. This has two major benefits for you: you get the guarantee of flawless quality, and the elimination of middle-man causes a swoop in prices, allowing you the richest sparkle at pocket-friendly budget. All that said, the array of garnet earrings isn’t where your shopping expedition must end. We have a lot more to offer you. Our staggering and remarkable array of jewellery will keep you coming back to us for more. Shop for the loving, favourite, and coveted features of rings, earrings, pendants, necklaces, and a lot more, only at TJC!